Danielle Shannon is the coordinator of the USDA Northern Forests Climate Hub and staff at the Northern Institute of Applied Climate Science (NIACS). Danielle helps land managers cope with and adapt to the challenges of climate change and is responsible for expanding the suite of adaptation resources at NIACS into the field of forest hydrology and the management of forested watersheds. Most recently, Danielle and her colleague Todd Ontl are leading efforts to help wetland managers adapt to climate change in the Midwest and Northeast. She has a M.S. from the University of Minnesota in Forest Hydrology and Watershed Management. Todd Ontl is the Fellow for the USDA Northern Forests Climate Hub with the Northern Institute of Applied Climate Science, and focuses on assisting natural resource managers in integrating climate change adaptation into land management. Todd’s areas of interests include applied research in understanding adaptation decision-making and synergies in adaptation and mitigation actions in forest management. His background includes an MS in plant community restoration, a PhD in plant-soil interactions and soil carbon dynamics, and post-doctoral research in climate change impacts to peatland ecosystems. Workshop Description: This one day workshop will introduce wetland managers to the concepts of climate change adaptation and present opportunities to develop actionable steps to prepare for and adapt ecosystems to changing conditions. This workshop draws upon resources created at the Northern Institute of Applied Climate Science (NIACS), including the structured decision-making process known as the Adaptation Workbook (adaptationworkbook.org). 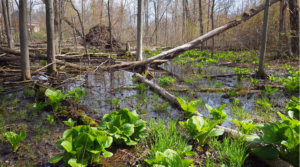 Participants are invited to select their interest in non-forested or forested systems, restoration, conservation, wetland mitigation, or other topics. Lunch will be provided. What are your areas of interest, or climate change adaptation questions? Let us know in the comments! If you have any trouble booking, please email Anne Garwood at garwooda@michigan.gov.